Along with Perfect Buoyancy the ability to navigate underwater is one of the fundamental skills that marks a competent diver. 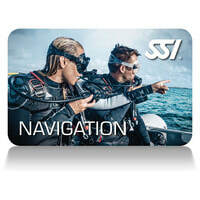 Being able to navigate underwater reduces stress and allows divers to get the most from their dives. At Endless Oceans Gozo our Instructors have found their way back from 1000s of dives and are happy to share their navigation experience with you. Through workshops and in-water practice you will learn different types of underwater navigation and earn your SSI Navigation Specialty Certification.